[ENGLISH SCHOOL] : WEST HAM CHURCH. [London : Cassell & Co., 1883]. 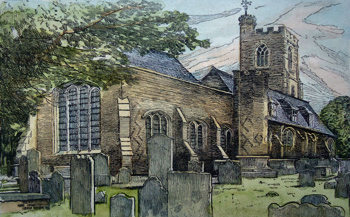 A pleasant antique print of the ancient parish church of All Saints, West Ham. Originally produced for the part-work “Greater London : A Narrative of its History, its People and its Places” published between 1882 and 1884. Wood engraving on paper. Later hand colour. Engraved surface 90 x 144mm (approx. 3-1/2” x 5-5/8”). Text on verso. In very good and clean state. A guaranteed genuine antique print. [ENGLISH SCHOOL] : WEST HAM PARK. [London : Cassell & Co., 1883]. 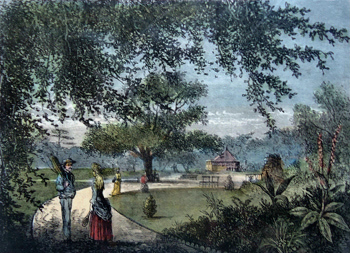 A pleasant antique print of West Ham Park – a man with a cricket bat address a lady with a raquet in the foreground. Originally produced for the part-work “Greater London : A Narrative of its History, its People and its Places” published between 1882 and 1884. SPARROW, Samuel Turner : ABBEY OF STRATFORD LANGTHORNE, ESSEX. [London] : S. Hooper, 1784. 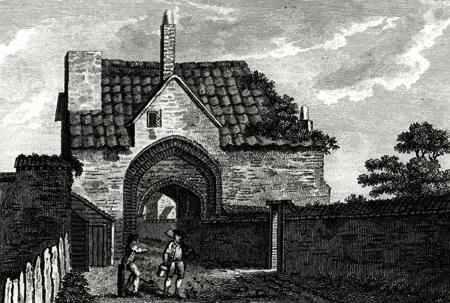 A pleasant antique print – the ancient Cistercian abbey of St. Mary Stratford Langthorne or West Ham Abbey – long since disappeared, although Abbey Road and Abbey Lane preserve the memory. Engraved by Samuel Turner Sparrow (fl.1773-1810) and originally produced for Francis Grose’s serially published “The Antiquities of England & Wales” (London : 1774-1787). Copper line engraving on paper. Engraved surface 106 x 151mm (approx. 4-1/8” x 6”). A few tiny specks, but overall in very good and clean state. A guaranteed genuine antique print. Return to London Prints index page. Return to East End index page.